Bring the family out to the new "gourmet hot dog place." 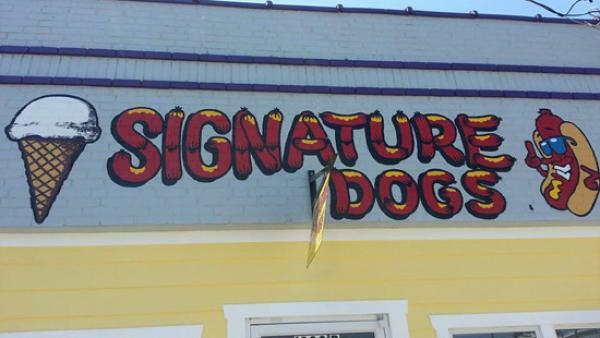 Enjoy your Signature dog, such as the Carolina Dog with chili, ketchup, mustard, onions and slaw; the Firehouse Dog with chili, cheese and jalapenos; the Law Dog with chili, cheese, grilled onions, and peppers; or the Rescue Dog with chili, cheese, and bacon. They also will add some chips, a pickle and a drink for a combo meal. Make sure you get some hand-dipped ice cream for dessert! Mon-Thu 11:00 a.m-7:00 p.m., Fri-Sat 11:00 a.m-9:00 p.m.